SAAM, provider of port services, logistics and towage in the Americas, said it has obtained earnings for $14.4 million in the April-June quarter of 2016, accumulating in the first semester a net income of $29 million, 26 percent higher than in the same period of the previous year. Ebitda, in turn, reached $53 million in the last quarter, including the results from its affiliates at their proportional value. This figure represents a 7 percent rise over the same quarter of 2015. During the semester, however, this figure reached $105 million. During the second quarter, SAAM’s ports division increased its sales by 13.4 percent ($66.6 million), and Ebitda reached $22.7 million. The CEO highlighted the performance of Terminal Internacional del Sur (Peru), which was incorporated to SAAM’s business portfolio in November, 2015, and where the operation of a new berth for mining loads was started. The company also noted positive results of the operational efficiency program applied in every terminal, the increase in sales in the ports of Iquique Terminal Internacional (ITI) and Portuaria Corral, plus the new services offered by Florida Terminal Internacional (FIT-USA), Terminal Portuario de Guayaquil (TPG-Ecuador) and San Vicente Terminal Internacional (SVTI). In the towage division, SAAM said sales remained stable (at $70.5 million) and its Ebitda reached $27.5 million, on good sales performance in Uruguay, Chile, Guatemala and Brazil, as well as special operations in Chile and Uruguay should be highlighted. 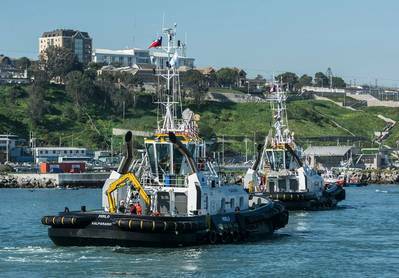 During the period, two new tugboats were incorporated to the fleet in Chile and contracts were adjudicated in the ports of Balboa and Cristobal (Panama) and Puerto Cortés (Honduras), thus strengthening the presence of the company in both the Atlantic and Pacific Coasts. All of this allowed offsetting the lower performance of operations in Mexico, affected by diminished activity due to the drop in the price of oil, SAAM said. The company’s logistics division recorded sales for $40.6 million and Ebitda was $2.8 million, due to lower performance of affiliates abroad, the effect of the closing of the operation of container depots and workshops in Brazil in the second semester of 2015 and the diminished activity in services to importers and exporters during the period.